Ed West is a journalist and social commentator who specialises in politics, religion and low culture. He is @edwestonline on Twitter. The landscape of parts of Japan looks like the aftermath of World War Two; no industrialised country since then has suffered such a death toll. The one tiny, tiny consolation is the extent to which it shows how humanity can rally round in times of adversity, with heroic British rescue teams joining colleagues from the US and elsewhere to fly out. And solidarity seems especially strong in Japan itself. Perhaps even more impressive than Japan’s technological power is its social strength, with supermarkets cutting prices and vending machine owners giving out free drinks as people work together to survive. Most noticeably of all, there has been no looting, and I’m not the only one curious about this. This is quite unusual among human cultures, and it’s unlikely it would be the case in Britain. During the 2007 floods in the West Country abandoned cars were broken into and free packs of bottled water were stolen. There was looting in Chile after the earthquake last year – so much so that troops were sent in; in New Orleans, Hurricane Katrina saw looting on a shocking scale. Why do some cultures react to disaster by reverting to everyone for himself, but others – especially the Japanese – display altruism even in adversity? The author started his article with a question and finished it providing no answer. That is quite understandable. I would also be reluctant to offer possible answers keeping in mind that our freedom of speech and expression is limited due to a number of taboos of our “politically correct” world. However, there were comments to the article some of which we copied below. They may offer some possible answers or at least give us some tips to them. In my turn, I would encourage you to share your views via email. Below please find some of the comments and please not that those comments do not necessarily reflect the position of the Administration of this web resource. The Japanese are honorable people! Lot of rubbish written on here but having visited Japan recently there are lot of differences compared to where I live in Sussex UK. People have respect for others in Japan,they are dignified and courteous. When you go out on the roads you dont see arrogance and aggression in driving which you see on every journey in Britain. I saw hundreds of drinks vending machines in Japan at all different locations, not one hint of vandalism, you would be lucky not to have half of them smashed up in this country. There is just no 'yobbo' element there unlike the UK, people know about respect and that’s why there is no looting. Anybody saying otherwise unfortunately is just making excuses for our society today. Why no looting in Japan? Because there's nothing to loot -- the tsunami swept everything and everyone away. Stop perpetuating race-based superiority myths. Japan's society isn't "better" than Haiti or any other country that's been hit with natural disasters lately. Japan's government is already trying to cover-up the nuclear disaster. 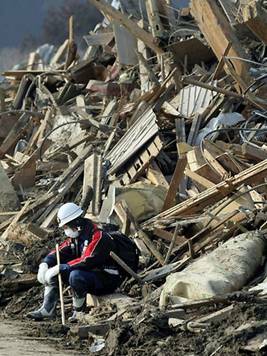 A better viewpoint-"Stop comparing Japan's disasters to others"
Are you trying to say there are no cultural differences in people's response to dramatic events ? I think you would find that proposition difficult to establish. Because the Japanese actually have a culture and are proud of who they are. They are 99% Japanese ethnicity. Multiculturalism means that people care less about one another. If I had a homeland to return to, I might consider doing that, especially when the disunity in the US starts to turn really bad. But my family has been here for 350 years so the only homeland I know is the US. Pointing out that the more homogeneous socieities tend to perform better in a wide range of social measures is not racist, although you are trying your rather dishonest best to make it seem that.